Rottweilers are the Renaissance men of the dog world and act with great alertness and self-assuredness. Powerful Rottweilers began as working dogs and have developed many talents over the centuries. One moment they’re rough, tumble and will work all day as drivers, LHDs, or pulling draft carts. The next moment these good-natured clowns are playful, fun-loving and gentle with family. You’ll find a Rottie placidly swimming in a pool, chewing on toys, sleeping in funny positions, or staring at himself in the mirror. Many families call them “big babies” or “gentle giants” yet other owners want them to be anything but. To begin picking out a gentle giant, look to the parents. Look at their size, shiny, double coated thick black and tan coat with signature eyebrows, temperament, and personality. Watch the puppies in their litter. Look for a puppy that is neither aggressive nor too submissive. Avoid picking “Alpha” pups that growl and nip at your hands; and avoid picking a puppy that’s too shy or afraid. Rotties have a wait-and-see attitude. Their natural aloofness means Rottweilers don’t make friends indiscriminately and aren’t welcoming of strangers until properly introduced. Training a Rottweiler puppy isn’t always an easy task. It will take time and it’s necessary to have a strong but gentle hand to raise, train, and socialize these dogs. Prevent dangerous situations through social interaction and training while they’re still puppies. It helps stave off territorial aggression. Avoid keeping Rotts stuck in the house all day without socialization, otherwise the dog will behave cautiously around anyone it doesn’t know. To begin socialization, keep the puppy on a lead and introduce him to an acquaintance slowly. Allow the pup to approach a calm and relaxed person. The puppy will most like sniff the hands and feet first. If you notice the young Rottie is growling, getting snappy, or nipping it’s important to oversee your pup, step in, and take control of the situation. You may hold the pup under the collar or put a long line connecting to the collar, so the pup can calm down and the owner can reel in the animal. Walk the puppy on the lead to further calm it down. Spend time properly training your Rottie; make sure it’s never in an abusive or neglectful circumstance. Reward the puppy when you notice positive behavior changes. Praises, exercise, edible treats, and toys are good rewards. 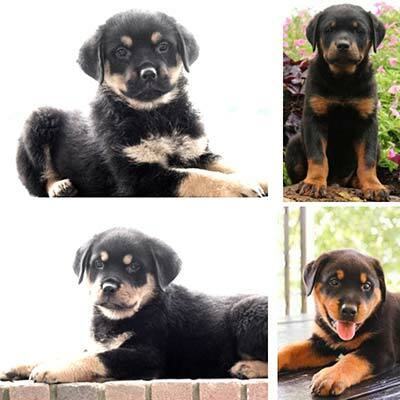 Rottweilers are obedient can be taught skills like “sit,” “down,” “come,” to eat on command, and “stay” as young as 9 weeks through clicker training, classical conditioning, and obedience classes. Make sure to treat these dogs as though they’re part of the family with lots of love and affection. Just don’t be surprised if your pup seems to conveniently forget it’s not a lap dog and will try to squeeze its oversized body onto your lap for attention. Be advised males can grow to be more than 130 pounds and stand up to 27 inches at the withers. Their big, heavy bodies make it a challenge to get it off your lap once it’s there. How did these giant dogs come to be? How did they get the stigma of being aggressive? Is it because they have 328 pounds of bite pressure? It’s important to look at the historical context to understand their strengths, demeanor and how their jobs have evolved over time due to human need. What is a Molossian Hound? Some scholars believe Rottweilers descended from a Mastiff-type dog called the Molossus of Italy. It’s a well-known breed of antiquity that came from what’s now known as Greece and Albania in 5,000 B.C. Molossus were believed to be highly intelligent, dependable, and rugged. The original Molossus or Molossian hound was a working dog that had been adapted to match what humans need. At the time it was important to people to have livestock guardians that also protect people. The smart, heavy dogs were bred to be a strong deterrent against predators. Molossian hounds were renowned for their ability to guard home as well as livestock. People lauded them for their bravery in their ability to fend off wolves or thieves and hunt large game. These devoted animals were biddable and eager to work. Many dogs have stemmed from the Molossus. Each have huge strong hind quarters, square heads and large bone structures. Scholars have various theories about how the Molossus was used by ancient man. Some scholars believe that the Molossus with its heavy dewlap and a wide short muzzle would fight in ancient Greek wars wearing mail armor and protective spike metal collars. Other scholars believe Molossers were used for hunting and herding. Molossers were used in ancient Rome for campaigns as well as to herd and guard animals. Around 74 A.D. the Roman army traveled across the Alps into Southern Germany. When the Romans encountered Germany many of the herding dogs were left behind. These dogs bred with local, German dogs in the town of Rottweil. There the Romans used the dogs to work as herders, by butchers to drive cattle to market, and carry home the money they received for their goods. Often the money was tied around the dog’s neck for safe keeping. These dogs were called Rottweilers, pronounced ˈrɒtwʌɪlə, or Rottweiler Metzgerhund meaning butcher’s dogs. For the next few centuries these dogs were continually used to herd, and drive cattle and haul meat to and from market (hence the name Butcher's dog) until the dogs were first replaced by donkeys and then in the 19th century railways replaced droving. As the need to bring meat to market dwindled there was a decline in the number of Rottweilers available. The breed nearly became extinct. During World War I there was a resurgence in interest due to an increase in demand for police dogs. During both World Wars Rottweilers served in many roles including messengers, ambulance, draft, and guard dogs. Today there is a life-sized bronze statue created by Ottman Hrl in 2005 that heralds these brave dogs in the city of Rottweil. In the end these dogs are revered because not only are they brave, strong, hard workers that look intimidating, they’re also cuddly, wonderful, devoted dogs that work in search and rescue, with police officers, as service dogs, and in therapy dog work. They’re strong working dogs that enjoy having a job to do. When properly trained and socialized, these dogs can be playful and goofy. Some with howl in unison with other dogs, snuggle on beds, or make funny noises when a family member scratches it’s head, romp and play around he house (and accidently knock over furniture in the process), interact with themselves in the mirror, jump on trampolines with their families, play with kittens, puppies in a playful and gentle way.